HRWF (07.12.2016) – In October – November, the Observatoire de la Christianophobie reported and documented a total of 23 anti-Catholic incidents in 19 different places. For the first 11 months of the year, the same observatory recorded 339 anti-Catholic incidents perpetrated in 70 different départements. During the night of 2-3 December, anti-Christian graffiti was tagged on the walls of the Catholic seminary of Bordeaux: “Neither nor Master”, “I love Satan”, and an untranslatable sexual insult. This form of hate speech is typical of extreme-left slogans. It is not the first time that extreme-left activists target symbolic places related to the Catholic Church in Bordeaux. Alain Juppé, who lost the primaries of the upcoming presidential elections against François Fillon, is the mayor of Bordeaux. He is not known to have condemned such an act. Other politicians have not reacted either, and the media has ignored the incident. 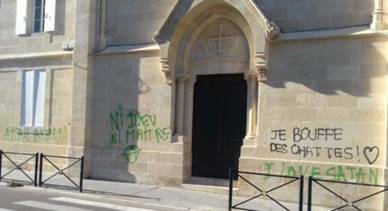 On 3 December and over the last few weeks, anti-Catholic anarchist slogans were tagged several times on St. Clement church in Nantes. Such incidents are rarely reported in the mainstream media. They are only published in local newspapers or publications with limited circulation.